The Castlelough Restaurant is an impressive dining room, much of which was built as part of the original house in 1820. It has high ceilings, large ornate mirrors and cornice work which reminds one of the great country houses of the past when dinner was the highlight of the day and ball gowns and black tie were the usual attire. Without a doubt, the most eye-catching feature of this magnificent room is the vast windows which span the full room, from one end to the other, ensuring that all are reminded of the breathtaking scenery just beyond the hotel. Dining in a space with this backdrop is memorable. Inevitably conversations can die out as guests are drawn again and again to gaze at the natural splendor of the mountains and lakes outside. Indeed the food on offer competes with this stunning vista for attention but with the range of fresh seafood, seasonal meats, organic vegetables, local cheeses and mouth-watering desserts used by our Chefs, as the flavors melt in the mouth, our dishes make themselves noticed. 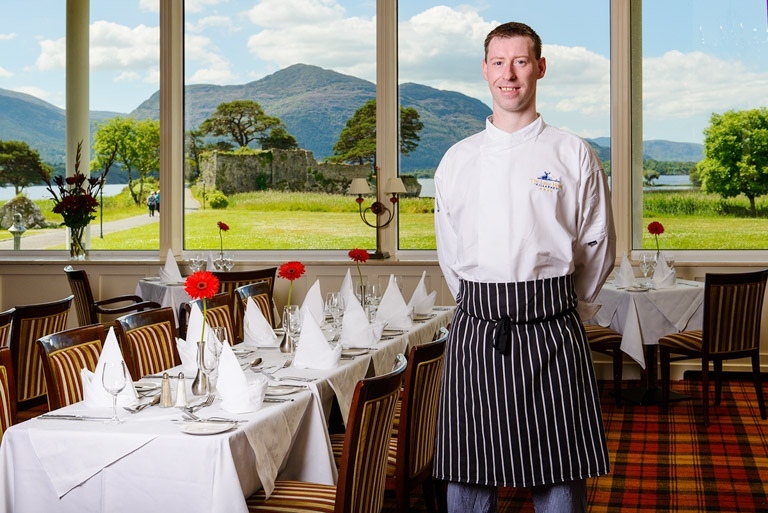 During 2015, the AA awarded The Castlelough Restaurant with two AA Rosettes in recognition of the high standard of food prepared and served and the use of locally sourced produce. We invite you to come and experience it for yourself with our Chef Noel Enright and his exciting new menus for 2019. The Castlelough Restaurant is open daily for breakfast from (7.30 in high season) 8 am to 10.30 am and for dinner from 6.00pm to 9.00pm. Table d’hote and a la carte menus are available. Special dietary requirements are catered for along with Vegetarian and Vegan menus.